The Raw crowd did the best they could with what they were given. Which was a terrible go home show for a PPV. They didn't have much, if anything, to cheer for so they definitely turned on the show with loud "boring" chants among other things. One high point for them was helping Enzo & Cass with their entrance promo when Anderson & Gallows "shut their mics off". SmackDown had their crowd in the palm of their hand for most of the night. They were cheering what needed to be cheered, booing what needed boo'ed, and seemed genuinely into the show. SmackDown wins. Yeah.. SmackDown wins here. Again. Like most every week because I simply enjoy JBL & Mauro more so than Byron & Michael Cole. Corey Graves gets the bad end of the stick here as he and Mauro are probably my two favorites, but he alone can't help the Raw commentary team. SmackDown wins here again. 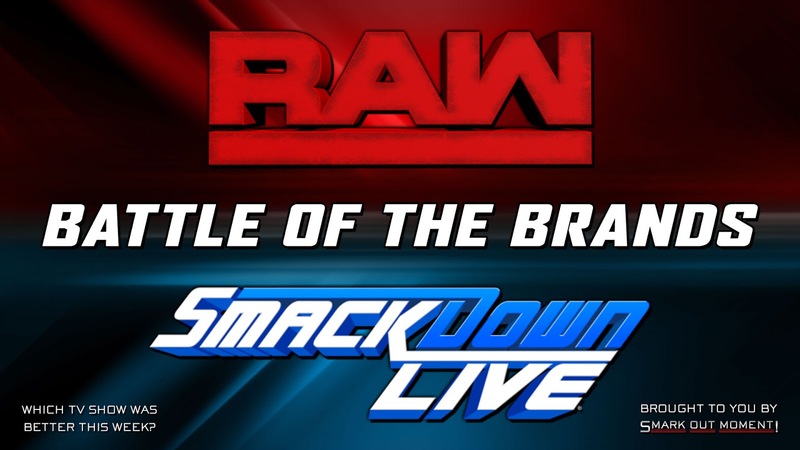 I'm predicting a full fledged sweep this week for the blue brand as Raw was just abysmal this week. At one point Raw had an arm wrestling "match" between Bayley and Dana Brooke.. Remember when Bayley was main eventing TakeOvers? Every other match, outside of the main event, lost my attention very quickly. By the time we got to the main event most people were checked out of the three hour show anyway. SmackDown had fun, entertaining, and meaningful matches throughout the night. Survivor Series qualifying matches with The Hype Bros vs. Ascension, and Nikki vs. Natty were both good bouts. The SmackDown Tag Teams Championship match with Heath & Rhyno vs. The Spirit Squad was a decent one too that I wasn't expecting. Then, of course, AJ vs. Dean was just as good as it should've been and having James Ellsworth hit another awesome superkick to AJ to cost Dean the match was good stuff. What happened to Paul Heyman? The greatest mic man in the history of the business fell flat in rough fashion Monday Night when he and his beast tried to call out Goldberg. Why in the world did WWE think that Lesnar would be a heel in his hometown? Clearly, the crowd was supposed to be chanting for Goldberg, but the majority were on the side of Suplex City. Heyman still tried to gain heat on Brock, in his hometown that loves him, but it didn't work. At all. The contract signing was terribly awkward for me as Mick Foley all the sudden was afraid for Sasha Banks & Charlotte inside hell in a cell when, for weeks now, he was treating it like a good thing or a reward of sorts for the two. Other than that, the opening promo was okay, but nothing overly special. SmackDown on the other hand, had some fun stuff. Randy Orton had a better promo than Heyman and all he said was, "If you can't beat em, join em." talking about The Wyatt Family and his turn on Kane. Dean and AJ, hell even James Ellsworth, all had decent mic segments throughout the night. Blue Brand clinches the win this week through the first four categories. Normally, I'd choose Raw here because the main event scene is fun for me. The KO, Jericho, Authority, and Rollins mix is fun, but I'm patiently waiting for the KO and Y2J friendship to implode. But this week I'm going with SmackDown. The main event scene with Dean and AJ was boring me a bit, but having James Ellsworth cost Dean his number one contendership has me intrigued as to what will happen in the weeks to come. Also, having Randy turn on Kane and "join" The Wyatt Family makes me think this is a Daniel Bryan storyline all over again. But again, I'm intrigued to see where this goes. Also, seeing SmackDowns Survivor Series teams begin to form over the next weeks will be interesting. Two hours > Three hours. By the time we got to a good Raw main event, most people had checked out of a rough three hour show. I was tuned into SmackDown from start to finish. I almost gave Raw a point here just for the sake of not having a complete sweep, and seeing how the shows are hard to distinguish in this category I probably could've and it would've been okay. But the way SmackDown handles The Wyatt Family, with the disappearing and reappearing, is impressive to me. It's simple, sure. But impressive and Raw doesn't have that aspect. So I'll give to SmackDown for having the slight edge. If Raw had any points to take away, I'd take away a half point for having an arm wrestling contest between Dana and Bayley. Then another half point for trying to draw heat on Brock Lesnar in his hometown when that clearly wasn't going to work. Why does Lesnar & Goldberg need to be heel vs. face? Just let it be Lesnar vs. Goldberg. Nonetheless, Raw doesn't have any points, but I thought the show was so bad that I'm taking it from them anyway. We have two firsts this week on Battle of the Brands! First time ever that one of the shows won all seven categories in one week, and the first time ever a show has finished with negative points. I thought this was one of the worst Raws I've ever watched, and it was incredibly weak for a go home show for one of your exclusive PPV's. SmackDown wins 7-(-1). Seven to negative one. Raw comes away with a -1 score, but the good news is that next week it can only get better. Right..?